In this list, we have compiled the top 10 best TVs under 40000 available in India as of 2018. The LED TVs on this list have large 43 to 49-inch display of Full HD or 4K Quad HD resolution. A couple of 55 inch LED TV have also been added. We have covered all top brands like Samsung, LG, VU, Onida, Micromax, Kodak, Panasonic and few others. LED TVs from brands like LG, Samsung are little overpriced but they do have great service network. Brands like VU, Panasonic, Kodak etc don't have a great service network but the prices are lower than bigger brands so this is the trade-off here. We have listed both non-smart and smart LED TVs on this list. Smart TVs are useful if you want to watch videos and movies directly via internet. If you are going to use cable or DTH only then non-smart TVs are fine. Smart TVs usually cost 4000-5000 more than non-smart TVs. You can also turn your non-smart TV into smart TV by Google Chromecast or Amazon Firestick. Both these dongles connect to your TV via HDMI port and have WIFI capabilities so you can play videos and movies directly in a non-smart TV with the help of any of these dongles. Google Chromecast is available on Flipkart and Firestick is available on Amazon. Here are the links to buy them: Buy Chromecast on Flipkart and Buy Firestick on Amazon. 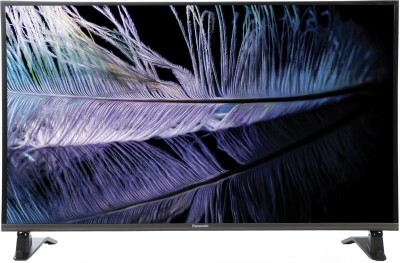 Let's take a look at top 10 best TVs under 40000. You will see that we have included an image of every LED with a brief overview, specs, and pros cons. Buy links are also provided every LED TV..
MarQ is a Flipkart brand in the electronic appliances and has covered a wide range of products very early and good reviews from users and experts. This LED TV offers an ultimate viewing experience as we witnessed on our encounter with this television. This LED TV comes with a big 55-inch display having the ULTRA HD (or 4K) resolution which offers seamless and perfect cinematic feel. The colours are bright and the display has wide viewing angles so you do not face any issue which watching the TV at any angle. The clarity of this 4K LED is amazing and provides a real-life experience The TV has a sleek profile with the screen stretched maximum to ends with very thin bezels on all 4 sides. This is a smart TV which comes with the Vewd app store to download games, video, mail or social media applications for the TV. The YouTube and Netflix apps are supported on this LED and even the remote comes with dedicated keys to launch the apps quickly. You would simply love watching entertainment content, movie, video because of the 4K resolution of the display. With the Quad core processor powering this LED Television, it prevents the blurring issue on the scene that involve fast moving objects. The speaker output is powerful at 20 W which offers decent output which can be easily enjoyed in a medium to a large sized room. This TV has 3 HDMI and 2 USB ports to connect a set-top box, laptops, pen drives, play stations etc. Overall, it is a great deal to get an Ultra HD (or a 4K LED TV) which is a smart tv at a price of under 40000 with a 55-inch display. If you can spend a little higher and want an Android certified television from MarQ with similar specifications, then you can check here on Flipkart. This is a 43 inch LED TV from Samsung's latest 2018 series of LED Televisions. It is a Smart TV and is priced well considering Samsung's brand value and after-sales service. The display panel is of 43 inches size and has a resolution of Full HD 1080p. It is one of the display panels you will see on LED TVs in this price range. The UltraClean View feature of this LED TV lets you view high-quality images with less distortion. The images look lifelike with vibrant colors and plenty of details. This Samsung LED TV sports a Micro Dimming Pro feature that divides the screen into zones to analyze each zone for deeper blacks and purer whites. This enhances the viewing experience. This LED TV delivers excellent sound output. Usually, we see 16 to 20W sound output but here it is 40W. Loud and clear sound on a large LED TV provides an immersive viewing experience. It has Smart Concert feature which lets you feel every beat. It is also equipped with the Beamforming technology. It is a Smart TV so you get the option to watch movies via the internet. You can play games as well. The Samsung SmartThings App allows you to experience many more exciting features on your TV, like Screen Mirroring or you can use your smartphone as a Remote Control. Overall, it is a really good LED TV from Samsung. Price is on the higher side as compared to brands like VU or Mi, but that is something you have to pay to get a Samsung product. Go for it if you are looking for a 43 inch LED TV under 40000 to 45000. This is a VU branded 43 Inch LED TV with an Ultra HD display having a resolution of 3840 x 2160. The display is bright with good viewing angles. The color reproduction and contrast are also good for the price range. The build quality is strong and looks great with premium titanium bezels across the periphery. This TV is powered by a Quad-core processor with 16 GB of internal storage and runs on Android 8.0 (Oreo) and you can download all the supported apps from Google Store. It is a smart TV under 30000 and comes with a number of features. The remote supports Vu ActiVoice feature where you can press the mic button on the remote to search the contents of TV. For speakers, there are dual built-in speakers with a total output of 20W. The volume is loud and clear with the TV supporting Dolby MS12 audio. The audio quality will surely cheer you up and give an ultimate experience. For connecting external devices, VU has provided 3 HDMI and 2 USB ports. Overall, It is one of the perfect LED TV for entertainment purpose in your home or office if you have a budget of under 30000. VU is our favorite brand in LED TV segment because of its low prices and high-quality products. The quality of VU LED TVs is similar to that of LG and Samsung but the price is way lower than them. This 50 inches LED from VU is a similar case. At a price of under Rs. 40000 you are getting a nice large 50-inch display of 4K Ultra HD resolution with high contrast and good viewing angles. The display panel is of A+ grade. It eliminates the ambient light reflection to offer you a deep, detailed and pure visual experience. The sound output is 24W delivered by dual speakers. The speakers support high-quality audio effects, such as Total Sonics, Total Surround, and Total Volume, for an immersive aural experience. This LED is a Smart Android TV which means you can connect it to WIFI and play videos, movies, and games. You explore the entire Google ecosystem, such as Play Store, Google Games, and Google Movies. You can also use the mirroring feature to mirror your phone display on to the television. The TV also supports voice recognition which can be very useful at times when you can't hold the remote in your hand. This is one of the best and our favorite 4K television under Rs. 35000- 40000. This LED TV is one of the most affordable and high value for money 49-inch Ultra HD Smart LED TV. Similar LED TV from other big brands like LG, Samsung will easily cost you more than 50000 but this is priced below 40000 which makes it one of the best-LED TV under 40000 range. The build is decent but not great but the TV looks premium because of the sleek metallic look design which gives it an extremely Thin & Premium Feel. The display quality is good and images look sharp and clear. As it is a Smart TV you get plenty of features. This Smart TV lets you cast movies, games, and photos from your Android smartphone or laptop to your TV, so you can enjoy your favorite content with vivid color and stunning clarity on a large display. You can also connect the TV to the internet via WIFI to watch movies, videos. One major positive of this tv is that it comes with a 3-year comprehensive warranty. Most brands offer just 1-year warranty but Mitashi is offering 3 years which is great. LG is one of the top brands in India and that's why the LED TVs from LG are expensive compared to other brands like VU, Onida, Micromax. The overall performance of this 43 inch LED TV is good and you won't face any issues. The LG 43LJ531T TV offers a display of Full HD resolution 1920x1080 pixels on a 108 cm (43) screen. This is great for a panel that is large in size and lets you watch high definition movies with good clarity and detail. The display can get really bright and has great viewing angles so that if there are a lot of people in a room, everyone gets a great view. LG’s Color Master Engine enhances the colors and colour saturation, hue and luminance as well. The 43 inch LED comes with two speakers that offer 20 W of sound output. Combine this with audio enhancements, such as Dolby Digital Plus and DTS support and you get a rich audio experience. The television comes with a bunch of games already installed. This is great for those with a child at home as they will be able to entertain themselves without any video game console. Go for it if you are looking for a 43 inch TV from a brand like LG under Rs. 40000. In India, Panasonic is an old brand build on trust and offers decent quality in its product. This is a smart television with 43-inch display size and is suitable for medium-sized rooms. It has a Full HD resolution and the display has a good level of brightness and color reproduction. On the design side, there are very thin bezels on the left, right and top and the television looks good. It is a smart TV and connects to WiFi and use YouTube or other supported media content applications. You can also browse through social media applications on this smart LED TV. As with all the internet enabled tv, you can directly cast and watch content from your mobile or laptop screen directly to the TV using WiFI without the need for transferring files. The speaker sound is immersive and you will not face any issue of loudness in a medium-sized room. If you are looking to spend around Rs. 30000 to 35000 and need a Smart TV from big brand, then this is a decent option. LG as known to all is the best brand in electronic appliances and the product are also expensive due to the brand value and quality. This is a Smart TV with a 43 inch display size having Full HD resolution. The design is beautiful and the build quality is top notch and very durable. The display on this television has crisp colours and good viewing angles and you wont find a reason to complain anytime. With the smart TV, you can connect to the WiFi to enjoy shows and video on entertainment application like YouTube and Netflix. The sound quality is very impressive and sufficiently loud that you would enjoy each moment of a movie or video you watch on this television. This 43 inch LED TV uses Miracast technology, that allows you to watch content from mobile or laptop on the big screen of the tv using WiFi. This LG LED also comes with energy saver mode and a standby mode that helps you save electricity. Overall for a budget of under 40000, this is a good option in a 43 inch Full HD led TV if you are looking for LG or Samsung brand only. Samsung is a well known brand across the world and one of the best brands in India as well. Their products are of great quality and have a higher price as well when compared other brands. Same is the case with this 43 inch LED. The TV comes with a decent 43-inch size display of Full HD resolution. As you would expect, the display panel is of great quality and delivers lifelike pictures with rich colors, good contrast and saturation. The viewing angles are great and you won't notice any issues even if you are watching tv from an angle. The audio is delivered by dual speakers which have an output of 14W. The sound is decent but not that great. For everyday viewing, you won't mind it. If you like to hear music at very high volume then maybe you might feel the need of external speakers. Everything about the LED is fine except that price is high and it is not a smart tv. So if you want to go with big brands then Samsung and LG are the best options for you. Samsung 43 inch Smart LED TV is our favourite under 40000. It is the latest TV from 2018 series. Samsung makes high-quality products and has a great service network as well. Plus, it is a Smart TV so you can watch movies and videos directly using an internet connection. 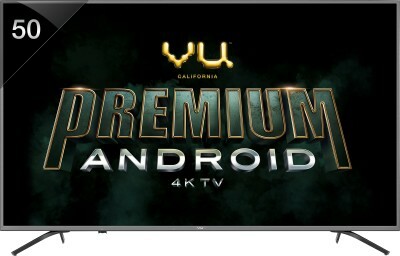 If you are looking for higher specification but have a lower budget, then you can check VU 50-inch ULTRA HD (4K) Smart TV.